CD review: "Proxima Estacin: Esperanza"
This review first appeared in the November 18, 2001 edition of the American Reporter. 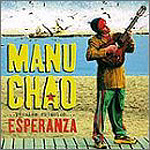 If France's Manu Chao is a regular resident at the top of the world beat music charts, it's with good reason. Seamlessly blending musical influences from across the globe, Chao's music is a hypnotic, almost addictive combination of accessibility and universality, with great melodies that get stuck in your head and arrangements as clever as those of any Top-40 hit-making machine. "Merry Blues," the opening track on his new release has a Cake meets the Buena Vista Social Club feel to it. The rhythms have more layers than a good lasagna, the horn charts punctuate like a typewriter, and Chao's vocals are fun, even if he's not singing in his (or your) native tongue. In fact, it's Chao's ability and willingness to pop back and forth from English to French to Spanish that gives this recording a feeling of welcome and hominess. His English is virtually without accent, and if our Spanish isn't good enough to judge his accent, it's for certain that Spanish-speakers can at least understand the man. He brings this multi-lingual approach to its fun-drenched peak on "Me Gustas Tu" ("I Like You,") in which he repeated asks in Spanish "Que voy a hacer" (What are you going to do), and replies in French "Je ne sais pas" (I don't know). Nearly as hypnotic is "La Primavera" ("The Springtime"), in which he asks "What time is it?" The answers matter not nearly as much as the trance-inducing beat. And that irresistible beat is the one consistent on an album that ranges globally in search of inspiration and ideas. Well, that and the very funky guitar work. If the guitar playing is credited, it's difficult to decipher in the highly psychedelic packaging  but whoever is playing it, it will stick in your head.